The prioritizr R package uses integer linear programming (ILP) techniques to provide a flexible interface for building and solving conservation planning problems (Rodrigues et al. 2000; Billionnet 2013). It supports a broad range of objectives, constraints, and penalties that can be used to custom-tailor conservation planning problems to the specific needs of a conservation planning exercise. Once built, conservation planning problems can be solved using a variety of commercial and open-source exact algorithm solvers. In contrast to the algorithms conventionally used to solve conservation problems, such as heuristics or simulated annealing (Ball et al. 2009), the exact algorithms used here are guaranteed to find optimal solutions. Furthermore, conservation problems can be constructed to optimize the spatial allocation of different management actions or zones, meaning that conservation practitioners can identify solutions that benefit multiple stakeholders. Finally, this package has the functionality to read input data formatted for the Marxan conservation planning program (Ball et al. 2009), and find much cheaper solutions in a much shorter period of time than Marxan (Beyer et al. 2016). Systematic conservation planning is a rigorous, repeatable, and structured approach to designing new protected areas that efficiently meet conservation objectives (Margules & Pressey 2000). Historically, conservation decision-making has often evaluated parcels opportunistically as they became available for purchase, donation, or under threat. Although purchasing such areas may improve the status quo, such decisions may not substantially enhance the long-term persistence of target species or communities. Faced with this realization, conservation planners began using decision support tools to help simulate alternative reserve designs over a range of different biodiversity and management goals and, ultimately, guide protected area acquisitions and management actions. Due to the systematic, evidence-based nature of these tools, conservation prioritization can help contribute to a transparent, inclusive, and more defensible decision making process. A conservation planning exercise typically starts by defining a study area. This study area should encompass all the areas relevant to the decision maker or the hypothesis being tested. The extent of a study area could encompass a a few important localities (e.g. Stigner et al. 2016), a single state (e.g. Kirkpatrick 1983), an entire country (Fuller et al. 2010), or the entire planet (Butchart et al. 2015). Next, the study area is divided into a set of discrete areas termed planning units. Each planning unit represents a discrete locality in the study area that can be managed independently of other areas. The general idea is that some combination of the planning units can be selected for conservation purposes. Planning units are often created as square or hexagon cells that are sized according to the scale of the management and the resolution of the data that underpin the planning exercise (but see Klein et al. 2009). Next, cost data are obtained and overlaid with the planning units. The cost data indicate the relative expenditure associated with managing each planning unit. For example, if the goal of the conservation planning exercise is to identify priority areas for expanding a local protected area system then the cost data could represent the physical cost of purchasing the land. Alternatively, if such data is not available, then human density is often used as a surrogate. Other examples of cost data include pest management costs (Auerbach et al. 2015), and the opportunity cost of foregone commercial activities (e.g. from logging, agriculture, or fishing; Ban & Klein 2009), or simply the size of the planning unit. Next, the conservation features that are relevant to the conservation planning exercise are defined. These features could be species (e.g. Neofelis nebulosa, the Clouded Leopard), populations, or habitats (e.g. mangroves or cloud forest) of interest. Finally, spatially explicit data should be obtained for each conservation feature, so that we know which features occur in which planning units (or how much of each feature occurs in each planning unit). Note that this process is not sequential—meaning that often planning units will often be remade depending on data quality and computational resources, different cost data sets will often be investigated, and the prioritization process will often be rerun using different sets of conservation features. After assembling all the data, the next step is to define the conservation planning problem. The prioritizr R package will not help you with assembling your planning unit data, cost data or feature data—but it will help you with defining and solving your planning problem. Formulating a conservation planning problem as a well-defined mathematical optimization problem is extremely useful because (i) it means that we can solve the exact problem you are dealing with and (ii) there is a rich body of knowledge we can draw on to deliver high quality solutions in a short period of time. In general, the goal of an optimization problem is to minimize (or maximize) an objective function that is calculated using a set of decision variables, subject to a series of constraints to ensure that solution exhibits specific properties. The objective function describe the quantity which we are trying to minimize (e.g. cost of the solution) or maximize (e.g. number of features conserved). The decision variables represent the entities that we can control, and indicate which planning units are selected for protection and which of those are not. The constraints can be thought of as rules that the need decision variables need to follow. For example, a commonly used constraint is specifying that the solution must not exceed a certain budget. Fortunately, a wide variety of approaches have been developed for solving optimization problems. Reserve design problems are frequently solved using simulated annealing (Kirkpatrick et al. 1983) or heuristics (Nicholls & Margules 1993; Moilanen 2007). These methods are conceptually simple and can be applied to a wide variety of optimization problems. However, they do not scale well for large or complex problems (Beyer et al. 2016). Additionally, these methods cannot tell you how close any given solution is to the optimal solution. Honestly, why would you go to all the effort of obtaining planning unit, cost, and feature data if you don’t know how good the solution is at the end of it? The prioritizr R package uses exact algorithms to efficiently solve conservation planning problems to within a pre-specified a optimality gap. In other words, you can specify that you need the optimal solution (i.e. a gap of 0 %) and the algorithms will, given enough time, find the optimal solution. In the past, exact algorithms have been too slow to be useful for most conservation planning exercises (Pressey et al. 1996), but improvements over the last decade mean that they are much faster and more effective than other commonly used methods (Achterberg & Wunderling 2013; Beyer et al. 2016). In this package, optimization problems are expressed using integer linear programming (ILP) so that they can be solved using (linear) exact algorithm solvers. The general form of an integer programming problem can be expressed in matrix notation using the following equation. Here, where \(x\) is a vector of decision variables, \(c\) and \(b\) are vectors of known coefficients, and \(A\) is the constraint matrix. The final term specifies a series of structural constants and the \(\Box\) symbol is used to indicate that the relational operators for the constraints can be either \(\geq\), \(=\), or \(\leq\). In the context of a conservation planning problem, \(c\) could be used to represent the planning unit costs, \(A\) could be used to store the data showing the presence / absence (or amount) of each feature in each planning unit, \(b\) could be used to represent minimum amount of habitat required for each species in the solution, the \(\Box\) could be set to \(\geq\) symbols to indicate that the total amount of each feature in the solution must exceed the quantities in \(b\). But there are many other ways of formulating the reserve selection problem (Rodrigues et al. 2000). create a new conservation planning problem by specifying the planning units, features, and management zones of conservation interest (e.g. species, ecosystems). add an objective to a conservation planning problem. add targets to a problem to specify how much of each feature is desired or required to be conserved in the solutions. add. constraints to a conservation planning problem to ensure that solutions exhibit specific properties (e.g. select specific planning units for protection). add penalties to a problem to penalize solutions according to specific metric (e.g. connectivity). add decisions to a problem to specify the nature of the decisions in the problem. add methods to generate a portfolio of solutions. add one of the solvers to a conservation problem to specify which software should be used to solve it and customize the optimization process. The general work flow when using the prioritizr R package starts with creating a new conservation planning problem object using data relevant to the conservation planning problem. Specifically, the problem object should be constructed using data that specify the planning units, biodiversity features, management zones (if applicable), and costs. After creating a new problem object, it can be customized—by adding objectives, penalties, constraints, and other information—to build a precise representation of the conservation planning problem required, and then solved to obtain a set of near-optimal solutions. All conservation planning problems require an objective. An objective specifies the property which is used to compare different feasible solutions. Simply put, the objective is the property of the solution which should be maximized or minimized during the optimization process. For instance, with the minimum set objective (specified using add_min_set_objective), we are seeking to minimize the cost of the solution (similar to Marxan). On the other hand, with the maximum coverage objective (specified using add_max_cover_objective), we are seeking to maximize the number of different features represented in the solution. Many objectives require targets (e.g. the minimum set objective). Targets are a specialized set of constraints that relate to the total quantity of each feature secured in the solution (e.g. amount of suitable habitat or number of individuals). In the case of the minimum set objective ( add_min_set_objective), they are used to ensure that solutions secure a sufficient quantity of each feature, and in other objectives, such as the maximum features objective ( add_max_features_objective) they are used to assess whether a feature has been adequately conserved by a candidate solution. Targets can be expressed numerically as the total amount required for a given feature (using add_absolute_targets), or as a proportion of the total amount found in the planning units (using add_relative_targets). Note that not all objectives require targets, and a warning will be thrown if an attempt is made to add targets to a problem with an objective that does not use them. Constraints and penalties can be added to a conservation planning problem to ensure that solutions exhibit a specific property or penalize solutions which don’t exhibit a specific property (respectively). The difference between constraints and penalties, strictly speaking, is constraints are used to rule out potential solutions that don’t exhibit a specific property. For instance, constraints can be used to ensure that specific planning units are selected in the solution for prioritization (using add_locked_in_constraints) or not selected in the solution for prioritization (using add_locked_out_constraints). On the other hand, penalties are combined with the objective of a problem, with a penalty factor, and the overall objective of the problem then becomes to minimize (or maximize) the primary objective function and the penalty function. For example, penalties can be added to a problem to penalize solutions that are excessively fragmented (using add_boundary_penalties). These penalties have a penalty argument that specifies the relative importance of having spatially clustered solutions. When the argument to penalty is high, then solutions which are less fragmented are valued more highly—even if they cost more—and when the argument to penalty is low, then the solutions which are more fragmented are valued less highly. After building a conservation problem, it can then be solved to obtain a solution (or portfolio of solutions if desired). The solution is returned in the same format as the planning unit data used to construct the problem. This means that if raster or shapefile / vector data was used when initializing the problem, then the solution will also be in raster or shapefile / vector data. This can be very helpful when it comes to interpreting and visualizing solutions because it means that the solution data does not first have to be merged with spatial data before they can be plotted on a map. Here we will provide an introduction to using the prrioritizr R package to build and solve a conservation planning problem. Please note that we will not cover conservation planning with multiple zones in this vignette, for more information on developing plans that involve allocating planning units to multiple management zones please see the zones vignette. First, we will load the prioritizr package. Now we will load some built-in data sets that are distributed with the prioritizr R package. This package contains several different planning unit data sets. To provide a comprehensive overview of the different ways that we can initialize a conservation planning problem we will load each of them. First, we will load the raster planning unit data (sim_pu_raster). Here, the planning units are represented as a raster (i.e. a RasterLayer object) and each pixel corresponds to the spatial extent of each panning unit. The pixel values correspond to the acquisition costs of each planning unit. Secondly, we will load one of the spatial vector planning unit data sets (sim_pu_polygons). Here, each polygon (i.e. feature using ArcGIS terminology) corresponds to a different planning unit. This data set has an attribute table that contains additional information about each polygon. Namely, the cost field (column) in the attribute table contains the acquisition cost for each planning unit. Thirdly, we will load some planning unit data stored in tabular format (i.e. data.frame format). For those familiar with Marxan or dealing with very large conservation planning problems (> 10 million planning units), it may be useful to work with data in this format because it does not contain any spatial information which will reduce computational burden. When using tabular data to initialize conservation planning problems, the data must follow the conventions used by Marxan. Specifically, each row in the planning unit table must correspond to a different planning unit. The table must also have an “id” column to provide a unique integer identifier for each planning unit, and it must also have a column that indicates the cost of each planning unit. For more information, please see the official Marxan documentation. Finally, we will load data showing the spatial distribution of the conservation features. Our conservation features (sim_features) are represented as a stack of raster objects (i.e. a RasterStack object) where each layer corresponds to a different feature (e.g. a multi-band GeoTIFF where each band corresponds to a different feature). The pixel values in each layer correspond to the amount of suitable habitat available in a given planning unit. Note that our planning unit raster layer and our conservation feature stack have exactly the same spatial properties (i.e. resolution, extent, coordinate reference system) so their pixels line up perfectly. After having loaded our planning unit and feature data, we will now try initializing the some conservation planning problems. There are a lot of different ways to initialize a conservation planning problem, so here we will just showcase a few of the more commonly used methods. For an exhaustive description of all the ways you can initialize a conservation problem, see the help file for the problem function (which you can open using the code ?problem). First off, we will initialize a conservation planning problem using the raster data. Generally, we recommend initializing problems using raster data where possible. This is because the problem function needs to calculate the amount of each feature in each planning unit, and by providing both the planning unit and feature data in raster format with the same spatial resolution, extents, and coordinate systems, this means that the problem function does not need to do any geo-processing behind the scenes. But sometimes we can’t use raster planning unit data because our planning units aren’t equal-sized grid cells. So, below is an example showing how we can initialize a conservation planning problem using planning units that are formatted as spatial vector data. Note that if we had pre-computed the amount of each feature in each planning unit and stored the data in the attribute table, we could pass in the names of the columns as an argument to the problem function. We can also initialize a conservation planning problem using tabular planning unit data (i.e. a data.frame). Since the tabular planning unit data does not contain any spatial information, we also have to provide the feature data in tabular format (i.e. a data.frame) and data showing the amount of each feature in each planning unit in tabular format (i.e. a data.frame). The feature data must have an “id” column containing a unique integer identifier for each feature, and the planning unit by feature data must contain the following three columns: “pu” corresponding to the planning unit identifiers, “species” corresponding to the feature identifiers, and “amount” showing the amount of a given feature in a given planning unit. For more information on initializing problems, please see the help page for the problem function (which you can open using the code ?problem). Now that we have initialized a conservation planning problem, we will show you how you can customize it to suit the exact needs of your conservation planning scenario. Although we initialized the conservation planning problems using several different methods, moving forward, we will only use raster-based planning unit data to keep things simple. The next step is to add an objective to the problem. A problem objective is used to specify the overall goal of the problem (i.e. the quantity that is to be maximized or minimized). All conservation planning problems involve minimizing or maximizing some kind of objective. For instance, we might require a solution that conserves enough habitat for each species while minimizing the overall cost of the reserve network. Alternatively, we might require a solution that maximizes the number of conserved species while ensuring that the cost of the reserve network does not exceed the budget. Please note that objectives are added in the same way regardless of the type of data used to initialize the problem. The prioritizr R package supports a variety of different objective functions. Minimum set objective: Minimize the cost of the solution whilst ensuring that all targets are met (Rodrigues et al. 2000). This objective is similar to that used in Marxan (Ball et al. 2009). For example, we can add a minimum set objective to a problem using the following code. Maximum cover objective: Represent at least one instance of as many features as possible within a given budget (Church et al. 1996). Maximum features objective: Fulfill as many targets as possible while ensuring that the cost of the solution does not exceed a budget (inspired by Cabeza & Moilanen 2001). This object is similar to the maximum cover objective except that we have the option of later specifying targets for each feature. In practice, this objective is more useful than the maximum cover objective because features often require a certain amount of area for them to persist and simply capturing a single instance of habitat for each feature is generally unlikely to enhance their long-term persistence. Maximum phylogenetic representation objective: Maximize the phylogenetic diversity of the features represented in the solution subject to a budget (inspired by Faith 1992; Rodrigues & Gaston 2002). This objective is similar to the maximum features objective except that emphasis is placed on phylogenetic representation rather than individual features. The prioritizr R package contains a simulated phylogeny that can be used with the simulated feature data (sim_phylogny). Maximum utility objective: Secure as much of the features as possible without exceeding a budget. This objective is functionally equivalent to selecting the planning units with the greatest amounts of each feature (e.g. species richness). Generally, we don’t encourage the use of this objective because it will only rarely identify complementary solutions—solutions which adequately conserve a range of different features—except perhaps to explore trade-offs or provide a baseline solution with which to compare other solutions. Most conservation planning problems require targets. Targets are used to specify the minimum amount or proportion of a feature’s distribution that needs to be protected in the solution. For example, we may want to develop a reserve network that will secure 20% of the distribution for each feature for minimal cost. Absolute targets: Targets are expressed as the total amount of each feature in the study area that need to be secured. For example, if we had binary feature data that showed the absence or presence of suitable habitat across the study area, we could set an absolute target as 5 to mean that we require 5 planning units with suitable habitat in the solution. Relative targets: Targets are set as a proportion (between 0 and 1) of the total amount of each feature in the study area. For example, if we had binary feature data and the feature occupied a total of 20 planning units in the study area, we could set a relative target of 50 % to specify that the solution must secure 10 planning units for the feature. We could alternatively specify an absolute target of 10 to achieve the same result, but sometimes proportions are easier to work with. Log-linear targets: Targets are expressed using scaling factors and log-linear interpolation. This method for specifying targets is commonly used for global prioritization analyses (Rodrigues et al. 2004). Manual targets: Targets are manually specified. This is only really recommended for advanced users or problems that involve multiple management zones. See the zones vignette for more information on these targets. As with the functions for specifying the objective of a problem, if we try adding multiple targets to a problem, only the most recently added set of targets are used. A constraint can be added to a conservation planning problem to ensure that all solutions exhibit a specific property. For example, they can be used to make sure that all solutions select a specific planning unit or that all selected planning units in the solution follow a certain configuration. The following constraints can be added to conservation planning problems in the prioritizr R package. Locked in constraints: Add constraints to ensure that certain planning units are prioritized in the solution. For example, it may be desirable to lock in planning units that are inside existing protected areas so that the solution fills in the gaps in the existing reserve network. Locked out constraints: Add constraints to ensure that certain planning units are not prioritized in the solution. For example, it may be useful to lock out planning units that have been degraded and are not suitable for conserving species. Neighbor constraints: Add constraints to a conservation problem to ensure that all selected planning units have at least a certain number of neighbors. Contiguity constraints: Add constraints to a conservation problem to ensure that all selected planning units are spatially connected to each other and form spatially contiguous unit. Feature contiguity constraints: Add constraints to ensure that each feature is represented in a contiguous unit of dispersible habitat. These constraints are a more advanced version of those implemented in the add_contiguity_constraints function, because they ensure that each feature is represented in a contiguous unit and not that the entire solution should form a contiguous unit. Mandatory allocation constraints: Add constraints to ensure that every planning unit is allocated to a management zone in the solution. Please note that this function can only be used with problems that contain multiple zones. For more information on problems with multiple zones and an example using this function, see the Management Zones vignette. In particular, The add_locked_in_constraints and add_locked_out_constraints functions are incredibly useful for real-world conservation planning exercises, so it’s worth pointing out that there are several ways we can specify which planning units should be locked in or out of the solutions. If we use raster planning unit data, we can also use raster data to specify which planning units should be locked in our locked out. If our planning unit data are in a spatial vector format (similar to the sim_pu_polygons data) or a tabular format (similar to pu_dat), we can use the field names in the data to refer to which planning units should be locked in and / or out. For example, the sim_pu_polygons object has TRUE / FALSE values in the “locked_in” field which indicate which planning units should be selected in the solution. We could use the data in this field to specify that those planning units with TRUE values should be locked in using the following methods. We can also add penalties to a problem to favor or penalize solutions according to a secondary objective. Unlike the constraint functions, these functions will add extra information to the objective function of the optimization function to penalize solutions that do not exhibit specific characteristics. For example, penalties can be added to a problem to avoid highly fragmented solutions at the expense of accepting slightly more expensive solutions. All penalty functions have a penalty argument that controls the relative importance of the secondary penalty function compared to the primary objective function. It is worth noting that incredibly low or incredibly high penalty values—relative to the main objective function—can cause problems to take a very long time to solve, so when trying out a range of different penalty values it can be helpful to limit the solver to run for a set period of time. The prioritizr R package currently offers only two methods for adding penalties to a conservation planning problem. Boundary penalties: Add penalties to penalize solutions that are excessively fragmented. These penalties are similar to those used in Marxan (Ball et al. 2009; Beyer et al. 2016). Connectivity penalties: Add penalties to favor solutions that select combinations of planning units with high connectivity between them. These penalties are similar to those used in Marxan with Zones (Watts et al. 2009; Beyer et al. 2016). This function supports both symmetric and asymmetric connectivities among planning units. Conservation planning problems involve making decisions on how planning units will be managed. These decisions are then associated with management actions (e.g. turning a planning unit into a protected area). The type of decision describes how the action is applied to planning units. For instance, the default decision-type is a binary decision type, meaning that we are either selecting or not selecting planning units for management. The prioritizr R package currently offers the following types of decisions for customizing problems. Binary decisions: Add a binary decision to a conservation planning problem. This is the classic decision of either prioritizing or not prioritizing a planning unit. Typically, this decision has the assumed action of buying the planning unit to include in a protected area network. If no decision is added to a problem object, then this decision class will be used by default. Proportion decisions: Add a proportion decision to a problem. This is a relaxed decision where a part of a planning unit can be prioritized, as opposed to the default of the entire planning unit. Typically, this decision has the assumed action of buying a fraction of a planning unit to include in a protected area network. Generally, problems can be solved much faster with proportion-type decisions than binary-type decisions, so they can be very useful when commercial solvers are not available. Semi-continuous decisions: Add a semi-continuous decision to a problem. This decision is similar to proportion decisions except that it has an upper bound parameter. By default, the decision can range from prioritizing none (0%) to all (100%) of a planning unit. However, a upper bound can be specified to ensure that at most only a fraction (e.g. 80%) of a planning unit can be purchased. This type of decision may be useful when it is not practical to conserve the entire area indicated by a planning unit. Next, after specifying the mathematical formulation that underpins your conservation planning problem, you can specify how the problem should be solved. If you do not specify this information, the prioritizr R package will automatically use the best solver currently installed on your system with some reasonable defaults. We strongly recommend installing the Gurobi software suite and the gurobi R package to solve problems, and for more information on this topic please refer to the Gurobi Installation Guide. Currently, the prioritizr R package only supports three different solvers. Gurobi solver: Gurobi is a state of the art commercial optimization software. It is by far the fastest of the solvers that can be used to solve conservation problems. However, it is not freely available. That said, special licenses are available to academics at no cost. Rsymphony solver: SYMPHONY is an open-source integer programming solver that is part of the Computational Infrastructure for Operations Research (COIN-OR) project, an initiative to promote development of open-source tools for operations research. The Rsymphony R package provides an interface to COIN-OR and is available on The Comprehensive R Archive Network (CRAN). lpsymphony solver: The lpsymphony R package provides a different interface to the COIN-OR software suite. This package may be easier to install on Windows and Mac OSX operating systems than the Rsymphony R package. Unlike the Rsymphony R package, the lpsymphony R package is distributed through Bioconductor. Many conservation planning exercises require a portfolio of solutions. For example, real-world exercises can involve presenting decision makers with a range of near-optimal decisions. Additionally, the number of times that different planning units are selected in different solutions can provide insight into their relative importance. The following methods are available for generating a portfolio of solutions. Cuts portfolio: Generate a portfolio of distinct solutions within a pre-specified optimality gap. Pool portfolio: Generate a portfolio of solutions by extracting feasible solutions from the solution pool. There are various methods for contructing the solution pool, but in most cases, setting the method argument to 2 is recomended because this will mean that the solution pool will contain a set number of solutions that are nearest to optimality (e.g. the top 10 solutions nearest to optimality). This method is the fastest for generating a portfolio of solutions, but it requires that the Gurobi optimization solver to be specified for solving problems. Shuffle portfolio: Generate a portfolio of solutions by randomly reordering the data prior to attempting to solve the problem. If the Gurobi optimization solver is not available, this method is the fastest method for generating a set number of solutions within a specified distance from optimality. Finally, after formulating our conservation planning problem and specifying how the problem should be solved, we can use the solve function to obtain a solution. Note that the solver will typically print out some information describing the size of the problem and report its progress when searching for a suitable solution. We can plot this solution because the planning unit input data are spatially referenced in a raster format. The output format will always match the planning unit data used to initialize the problem. For example, the solution to a problem with planning units in a spatial vector (shapefile) format would also be in a spatial vector format. Similarly, if the planning units were in a tabular format (i.e. data.frame), the solution would also be returned in a tabular format. We can also extract attributes from the solution that describe the quality of the solution and the optimization process. Although users are encouraged to build and tailor conservation planning problems to suit their own needs using the problem function, sometimes it just simply easier to use a more familiar formulation. The marxan_problem function is provided as a convenient wrapper for building and solving Marxan-style conservation problems. If users already have their conservation planning data formatted for use with Marxan, this function can also read Marxan data files and solve the Marxan-style problems using exact algorithm solvers. Please note that problems built using the marxan_problem function are still solved the same way as a problem initialized using the problem function, and therefore still require the installation of one of the solver packages. Here is a short example showing how the marxan_problem function can be used to read Marxan input files and the solve function can be used to solve the problem. Alternatively, rather then using a Marxan input file to construct the problem, we can manually read in the Marxan data files and input these to the marxan_problem function. After obtaining the solution to a conservation planning problem, it can be useful to calculate various summary statistics to describe its performance (such as solution cost). These statistics could be calculated using external software platforms such as ArcGIS or QGIS, but it is also possible to calculate these statistics within R. If you are dealing with raster planning unit data, and so your solutions are in raster format, the cellStats, layerStats, extract, and zonal functions from the raster R package can be useful for calculating summary statistics. Below we will create and solve a problem, and then calculate some statistics showcasing these functions. Hopefully, this vignette has provided an informative introduction to the prioritizr R package. 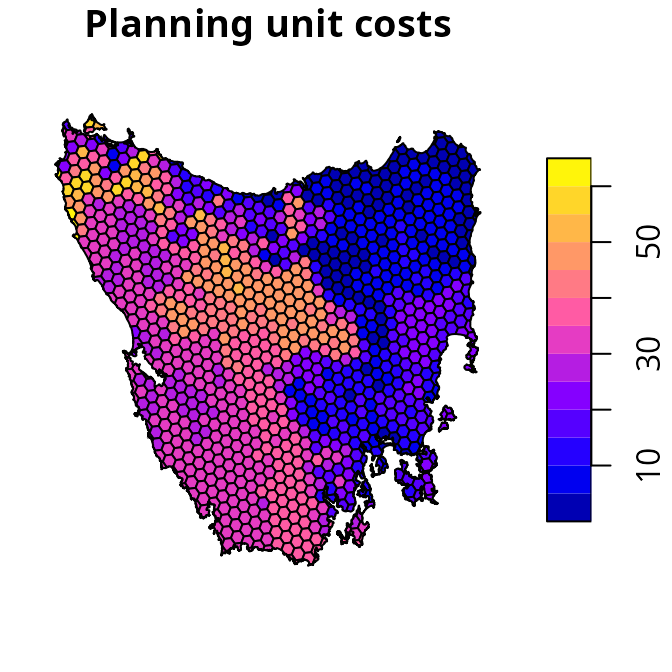 For more worked examples using the prioritizr R package, check out the Tasmania and Salt Spring Island vignettes. Perhaps, one of the best ways to learn a new piece of software is to just try it out. Test it, try breaking it, make mistakes, and learn from them. We would recommend trying to build conservation planning problems that resemble those you face in your own work—but using the built-in example data sets. This way you can quickly verify that the problems you build actually mean what you think they mean. For instance, you can try playing around with the targets and see what effect they have on the solutions, or try playing around with penalties and see what effect they have on the solutions. Finally, if you have any questions about using the prioritizr R package or suggestions for improving the prioritizr R package (perhaps addressing some spelling mistakes found whilst reading this vignette? ), please file an issue on the package’s online coding repository (https://github.com/prioritizr/prioritizr/issues). Achterberg, T. & Wunderling, R. (2013). Mixed Integer Programming: Analyzing 12 Years of Progress. Facets of combinatorial optimization: Festschrift for martin grötschel (eds M. Jünger & G. Reinelt), pp. 449–481. Springer, Berlin, Heidelberg. Auerbach, N.A., Wilson, K.A., Tulloch, A.I., Rhodes, J.R., Hanson, J.O. & Possingham, H.P. (2015). Effects of threat management interactions on conservation priorities. Conservation Biology, 29, 1626–1635. Ball, I., Possingham, H. & Watts, M.E. (2009). Marxan and relatives: Software for spatial conservation prioritisation. Spatial Conservation Prioritisation: Quantitative Methods & Computational Tools (eds A. Moilanen, K.A. Wilson & H. Possingham), pp. 185–189. Oxford University Press, Oxford, UK. Ban, N.C. & Klein, C.J. (2009). Spatial socioeconomic data as a cost in systematic marine conservation planning. Conservation Letters, 2, 206–215. Beyer, H.L., Dujardin, Y., Watts, M.E. & Possingham, H.P. (2016). Solving conservation planning problems with integer linear programming. Ecological Modelling, 328, 14–22. Billionnet, A. (2013). Mathematical optimization ideas for biodiversity conservation. European Journal of Operational Research, 231, 514–534. Butchart, S.H., Clarke, M., Smith, R.J., Sykes, R.E., Scharlemann, J.P., Harfoot, M., Buchanan, G.M., Angulo, A., Balmford, A., Bertzky, B. & others. (2015). Shortfalls and solutions for meeting national and global conservation area targets. Conservation Letters, 8, 329–337. Cabeza, M. & Moilanen, A. (2001). Design of reserve networks and the persistence of biodiversity. Trends in Ecology & Evolution, 16, 242–248. Church, R.L., Stoms, D.M. & Davis, F.W. (1996). Reserve selection as a maximal covering location problem. Biological conservation, 76, 105–112. Faith, D.P. (1992). Conservation evaluation and phylogenetic diversity. Biological Conservation, 61, 1–10. Fuller, R.A., McDonald-Madden, E., Wilson, K.A., Carwardine, J., Grantham, H.S., Watson, J.E., Klein, C.J., Green, D.C. & Possingham, H.P. (2010). Replacing underperforming protected areas achieves better conservation outcomes. Nature, 466, 365. Kirkpatrick, J.B. (1983). An iterative method for establishing priorities for the selection of nature reserves: An example from Tasmania. Biological Conservation, 25, 127–134. Kirkpatrick, S., Gelatt, C.D. & Vecchi, M.P. (1983). Optimization by simulated annealing. Science, 220, 671–680. Klein, C., Wilson, K., Watts, M., Stein, J., Berry, S., Carwardine, J., Smith, M.S., Mackey, B. & Possingham, H. (2009). Incorporating ecological and evolutionary processes into continental-scale conservation planning. Ecological Applications, 19, 206–217. Margules, C.R. & Pressey, R.L. (2000). Systematic conservation planning. Nature, 405, 243–253. Moilanen, A. (2007). Landscape Zonation, benefit functions and target-based planning: Unifying reserve selection strategies. Biological Conservation, 134, 571–579. Nicholls, A.O. & Margules, C.R. (1993). An upgraded reserve selection algorithm. Biological Conservation, 64, 165–169. Pressey, R.L., Possingham, H.P. & Margules, C.R. (1996). Optimality in reserve selection algorithms: When does it matter and how much? Biological Conservation, 76, 259–267. Rodrigues, A.S. & Gaston, K.J. (2002). Maximising phylogenetic diversity in the selection of networks of conservation areas. Biological Conservation, 105, 103–111. Rodrigues, A.S., Akcakaya, H.R., Andelman, S.J., Bakarr, M.I., Boitani, L., Brooks, T.M., Chanson, J.S., Fishpool, L.D., Da Fonseca, G.A., Gaston, K.J. & others. (2004). Global gap analysis: Priority regions for expanding the global protected-area network. BioScience, 54, 1092–1100. Rodrigues, A.S., Orestes Cerdeira, J. & Gaston, K.J. (2000). Flexibility, efficiency, and accountability: Adapting reserve selection algorithms to more complex conservation problems. Ecography, 23, 565–574. Stigner, M.G., Beyer, H.L., Klein, C.J. & Fuller, R.A. (2016). Reconciling recreational use and conservation values in a coastal protected area. Journal of Applied Ecology, 53, 1206–1214. Watts, M.E., Ball, I.R., Stewart, R.S., Klein, C.J., Wilson, K., Steinback, C., Lourival, R., Kircher, L. & Possingham, H.P. (2009). Marxan with Zones: Software for optimal conservation based land- and sea-use zoning. Environmental Modelling & Software, 24, 1513–1521.